The Denver Broncos Field Level Corner End Zone describes a small section on the first level of seating at Sports Authority Field at Mile High. 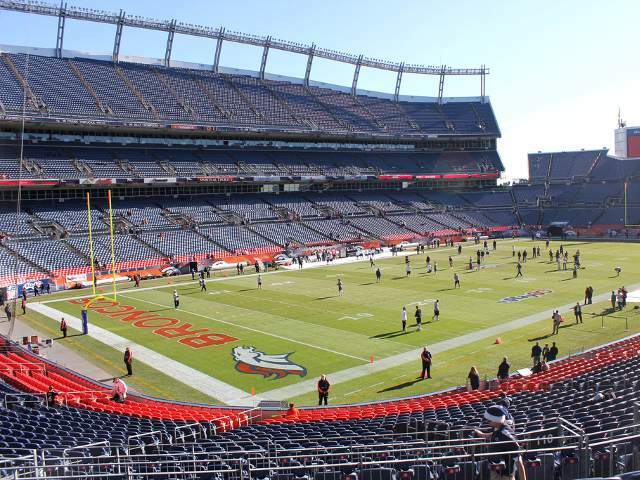 The Sports Authority Field at Mile High seating chart shows the Field Level Corner End Zone seats in eight total sections between the goal lines and the corners of each end zone. Denver Broncos Field Level Corner End Zone seats are segmented in four groups of two sections each. Near the south end zone on the Broncos sideline are section 100 and section 101. Near the north end zone on the Broncos sideline are section 109 and section 110. Near the north end zone on the visitor’s sideline are section 118 and section 119. Near the south end zone on the visitor’s sideline are section 127 and section 128. All Field Level Corner End Zone seats provide a good view of the game when the ball is by the near end zone. When plays occur by the far end zone it can be difficult to follow the action from Field Level Corner End Zone seats close to the field. The best seats in the seating area are closest to the 50-yard line immediately across an aisle from the more expensive Field Level Between Goal Lines sections. Broncos Field Level Corner End Zone tickets are sold first to season ticket holders who purchase a full season ticket of two preseason games and eight regular season games. Following the conclusion of season ticket sales, any remaining tickets are offered as single game tickets to any interested fans. Prices change based on the cost of Broncos season tickets, but Field Level Corner End Zone tickets are currently the second cheapest ticket option on the first level of Sports Authority Field at Mile High.